The Mink is a member of the weasel family. The species found in Ireland is the American Mink which is bigger than the European Mink. 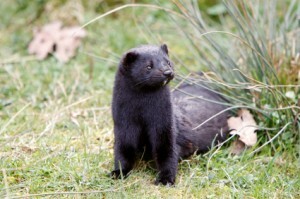 Mink are usually escapees from mink farms which were established here in the 1950′s. In general mink are about 18 to 24 inches in length, including its bushy 5- to 7-inch tail, and weighs 1 1/2 to 3 pound. The mink readily adapted to their new environment and spread rapidly, establishing themselves at the top of the food chain. Their typical habitat includes stream, river, pond, marsh, swamp, or lake. Mink will attack animals up to the size of a chicken, duck, rabbit, or new born lamb. Like some other members of the weasel family, mink can exhibit “surplus killing” behavior when presented with an abundance of food, such as in a poultry house full of chickens. Mink are capable of eating significant numbers of nesting waterfowl and young game birds. In addition, they kill fish of all species including ornamental pond fish. They typically kill their prey by biting them through the skull or neck. Two closely spaced neat skin punctures on the neck or skull are the sign of a mink kill. Mink are not protected in Ireland. They have a negative effect on fish stocks and waterfowl, and are regarded as a pest. 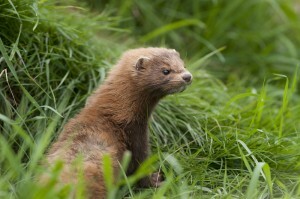 Although they are not hunted commercially in Ireland, mink may be humanely trapped and terminated for control reasons. As with foxes and feral cats, mink are very aggressive when cornered, therefore, any necessary control should only be carried out by a wildlife control specialist. Wildlife Management Services have been providing mink control for the last 10 years and are experts in the field. Please contact us at 087 6410206, 057 8623042 with your mink problem.